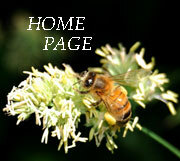 ﻿ Introduced and Invasive species in France. Introduced and Invasive species in France. I would imagine that everyone is aware to some extent or another of the issues surrounding species that are not native to France but that have been introduced as a result of human activity. 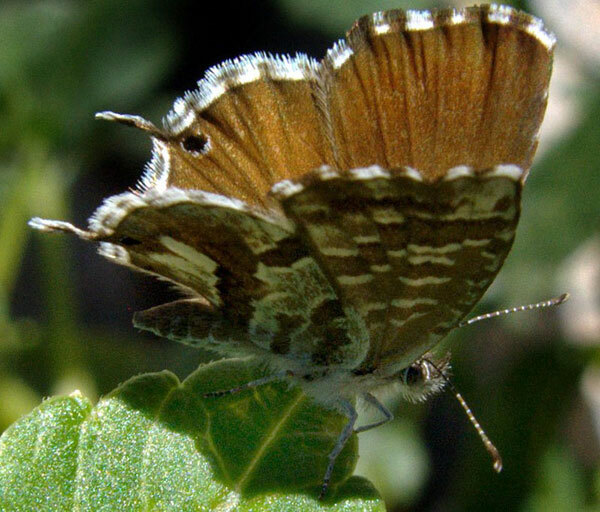 In France today we can count in excess of 2,200 such introduced species and although many are considered to be relatively innocuous there are a substantial number that seriously impact on our native species and habitat structures. In this article I’ve tried to stick to species that most people in France will have either seen or stand a good chance of seeing. The issue isn’t a particularly new one and the first species that started to be moved around the world by humans can be traced back certainly to the Romans and in France we have an example of this in the Edible Dormouse, (Glis glis or Loir as some will know them), that the Romans brought to France to keep for eating. The Romans also brought us the forerunner of the domestic cat which they valued for controlling rodents in grain stores. Later in the 12th century the Saracens brought the Genet with them to Spain and South west France to perform a similar role in keeping down rodents in their buildings. All of these have been here for so long now that they are considered to be native species but this brings us to an interesting dilemma, how long does a species have to be present before it is no longer considered to be introduced or non native? In short there is no agreed answer and is the subject of much debate. What I would like to do is divert your attention for a moment to what is called the 6th great extinction or Holocene extinction where here at least there is general agreement that the issue of introduced species is and has been playing a significant role, however once again there is no general agreement on when the 6th Great extinction began although most consider it to be closely connected with human activity and certainly with the start of settled agriculture some 10,000 years ago in what is now central and south eastern Turkey. In fact the IUCN, (International Union for Conservation of Nature), the worlds recognised body in this field puts introduced species in second place to habitat loss as the two greatest causes of species extinction. Of course habitat loss includes every form of destruction or modification of our environment that is detrimental to other species. One more point to make here is that the last 150 years have seen the greatest number of non native species introduced by humans around the world and it is still continuing at an accelerated rate and as we will see globalisation as a whole is bringing us more than just cheap products and plants for our gardens, it is changing the very nature and fabric of our environment. 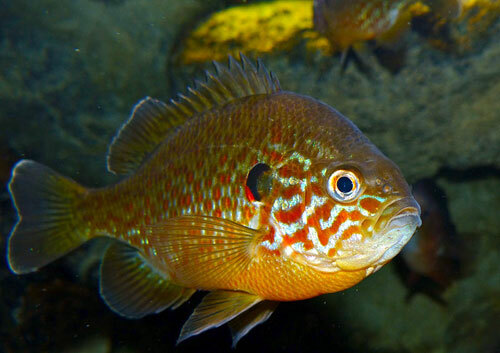 If we start with the ponds, rivers, lakes and canals we find an almost unbelievable 30 plus species of fish alone that shouldn’t be here and anglers will be well aware of some of them, the Pumpkinseed (Lepomis gibbosus), a North American member of the sunfish family as well as the so called Pikeperch, (Sander lucioperca), and the European catfish, (Silurus glanis), the later both top predators. Goldfish everyone knows and these have been widely released into ponds and lakes often with disastrous consequences for some of our native amphibians that also suffer from the presence of the Red swamp crayfish, Procambarus clarkia, a particularly voracious predator that can cross land and survive in burrows when lakes are drained or ponds dry out. Another species that has been widely released into ponds and canals is the red-eared slider (Trachemys scripta elegans), also known as the red-eared terrapin. It is a semiaquatic turtle belonging to the family Emydidae and is probably the most popular pet turtle in the world and is included in the list of the world's 100 most invasive species published by the IUCN. As with so many exotic pets people decide for one reason or another to release them into the wild. Principally in Aquitaine but also to be found in other lakes in France is the American Bullfrog, Lithobates catesbeianus, a real monster that can reach 20cm in length. 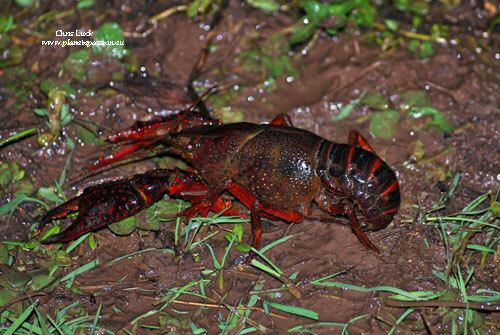 This is a species that is a serious threat where present eating a wide range of prey including amphibians, fish, small mammals, ducklings and small bird species as well as molluscs, crustaceans and insects. On the subject of crustaceans the Asian Clam Corbicula fluminea arrived in about 1980 and is now found in the rivers of the four main drainage basins the Garonne, the Rhone, the Loire and the Seine, as well as the French part of the Rhine basin. Canals have played an important role in the spreading of this and other species, their small empty shells will be seen in large heaps where they collect in the shallows of rivers. Even the coastline isn’t spared with Hemigrapsus takanoi, the brush-clawed shore crab, (Asian shore crab), that initially arrived on the Atlantic coastline but have now spread along the channel and are expected to continue throughout the North Sea region. On the insect front few will be unaware of the presence of the Asian Hornet that has spread more or less all over France in the last 10 years but there are hundreds of other introduced insect species including some that people may easily come across. The Geranium moth, Cacyreus marshalli, is a native of South Africa and was introduced to Europe with shipments of geraniums, (pelargoniums), the host plant of its caterpillars. It has spread from the south of France and is now often seen in towns and villages on displays of geraniums as far north as Poitou Charentes. Another moth that is causing quite severe damage where present is the Box moth, Cydalima perspectalis, another Asian import that has spread rapidly throughout much of Europe in 10 years and can devastate box hedges in no time where there are large numbers present. 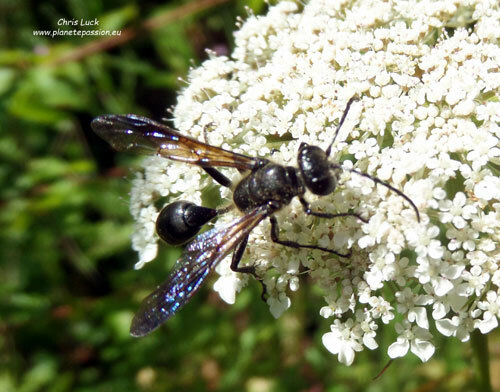 The Grass-carrying wasp, Isodontia mexicana, is a solitary wasp species with a completely black body about 2cm long originally from the USA. Although it’s one of the species that has little environmental impact it is an insect you may see building a nest in a hollow stem or something similar where they line the inside with grass fragments or other plant fibres hence the name of Grass-carrying wasps. They then catch small grasshoppers etc and feed their emerging larvae with the living, but paralysed prey. Couldn’t leave insects without a mention of the Harlequin ladybirds, Harmonia axyridis, the most invasive ladybird on earth, native to Eastern Asia they were introduced into large scale greenhouse production to control aphids but are now endemic in Europe and are a species that exhibits a vast range of colours and markings. This is the species that people see in their houses etc in large groups, sometimes hundreds, in winter often huddled in a window or other sheltered place. Introduced mammals are well represented by Coypu or Ragondin as some will know them, a species originally imported along with American Mink and Musk rats for the fur industry. Following escapes and deliberate releases in the 1930’s when demand fell in the global depression they have all spread to most regions of France and are now a constant problem, Coypu in particular for lake owners where they dig tunnels in the bank sides and eat the aquatic vegetation. When it comes to plants Japanese knotweed, Fallopia japonica, is by far the best known name even if a surprisingly large number of people don’t recognise it when they see it. It’s an attractive plant introduced to Europe in the first half of the 19th century that grows to more than 2 metres suppressing all other growth with its bamboo like stems. Mercifully it doesn’t produce seeds but the tiniest piece of root is enough for it to grow and spread, even a piece a couple of centimetres tossed carelessly on the ground can take hold. Creeping water-primrose, Ludwigia peploides, originally imported from South America either directly or via an intermediate country, (USA for example), as an ornamental plant for ponds. It colonises still or relatively slow moving water to a depth of 3 metres with its rhizomes and can be spread via a tiny fragments of plant that break off. 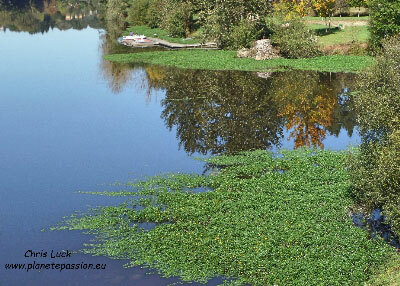 We see it summer when it carpets the shallows of major rivers and in some smaller waters it can completely block them with its deep green leaves and brilliant yellow flowers. 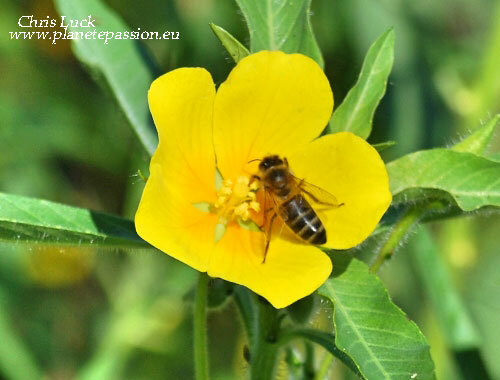 Above: Creeping water primrose with a honey bee and below coating the edges of the Vienne river. These few examples show us that it’s clear that in almost all cases there is no putting the genie back in the bottle, from Asian Hornet to Coypu we have to accept that only the strong will survive and that our native species will either adapt or fail. Sadly the greatest impact, as is so often the case, would seem to be on our rivers, lakes and ponds and the species they contain these being the most difficult places to find the means to remove the “invaders”.